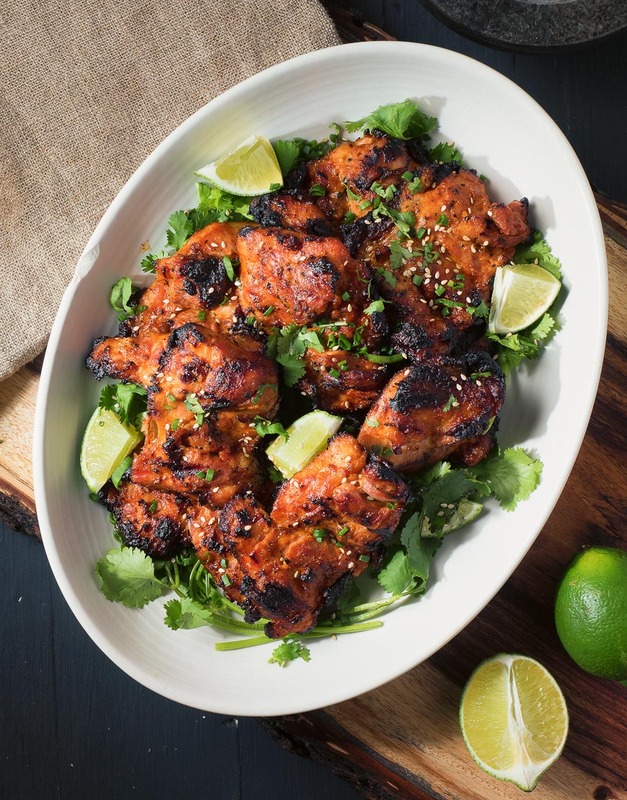 Spicy miso grilled chicken is a Korean inspired dish worthy of your next backyard grilling party. Bright Korean flavours work beautifully here. And it’s no surprise. How long have the Koreans been serving BBQ? I’ve been getting into miso lately. The salty, earthy, savory flavour just seems to add magic to everything it touches. I saw recipe for Japanese broiled miso chicken. Looked really good. Subtle and understated in that Japanese way. But so tasty. Then I started thinking. What if I made that but slammed it up against Korean zing? And tossed it on the grill? It worked. In the end, spicy miso grilled chicken is more Korean than Japanese. Subtle Japanese inspiration crushed by a big dollop of gochujang. Gochujang is like miso jacked up with Korean flavours. It’s chili and fermented soybean. Straight up it’s pretty assertive. Mix miso and gochujang and you mellow out the bite. That’s why this works. The miso smooths things out nicely. What you wind up with is grilled chicken that tastes Korean but tempered somehow by the miso. It’s an umami bomb. No doubt about that. But there’s more Japanese influence here. Mirin and sugar lend a sweet note. Sake adds a little something too. And in the end it comes together in a way that’s hard to put a finger on. 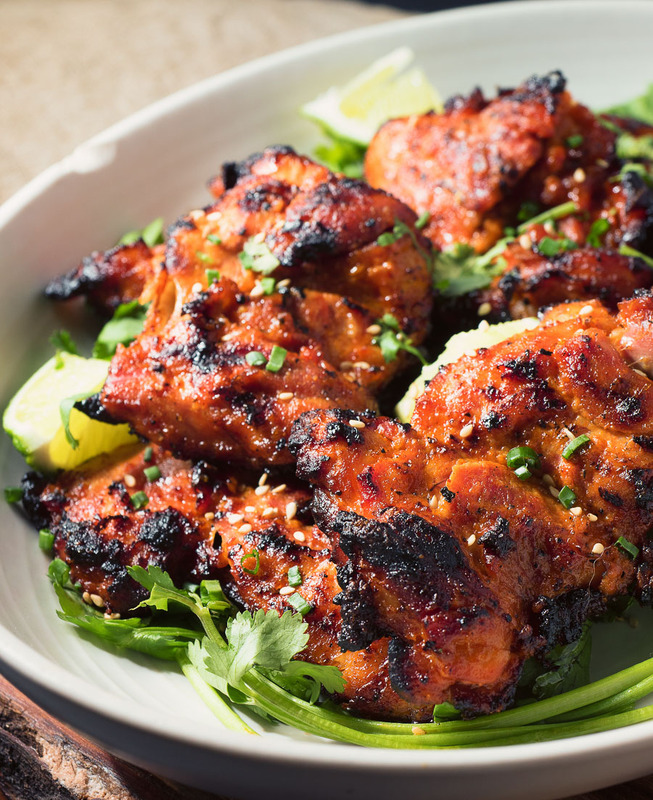 Just tasty Asian inspired grilled chicken. Grilling technique is really important in this recipe. There’s sugar in the marinade. There’s skin on the chicken. Direct heat invites burning. Burning badly. Indirect, medium hot heat is what you are after. Set your grill up so there’s no fire directly under the chicken. It’s a good idea to put a drip pan under the grill grate too. The fat dripping from the chicken will make a big mess otherwise. Once the chicken is almost done it over the direct heat to char up a bit. Do this a few pieces at a time. You are going to get flare-ups. Stay cool. Stay calm. Use long tongs. It will be OK.
Don’t fear the grill. It’s a tool. Own it. It’s there to serve you. Once you have the char you want move the pieces back to the safe zone. Keep doing that until all the chicken is just the way you want it. 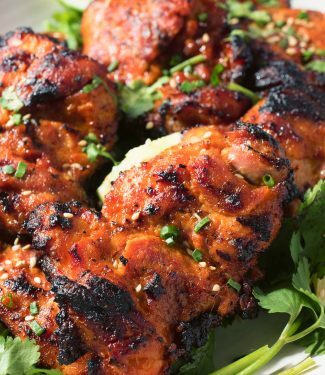 Spicy miso grilled chicken mixes Japanese and Korean flavour for great tasting grilling. If you don't have gochujang, you can just mix in another chili sauce. Sambal oelek or even Sriracha would work here. The chicken is delicious hot or cold. Combine all the ingredients except the chicken and mix thoroughly. Toss the chicken in the marinade and refrigerate for 1 to 4 hours. Set your grill up for indirect, medium high heat. Place a drip pan under the grill where you will be putting the chicken. Grill until the chicken reaches an internal temperature of 175F, about 20-25 minutes. Working in batches of 2 or 3 pieces, place the chicken over direct heat to colour up. If you don't have gochujang, you can use a different chili paste. Use 4 Tbsp shiro miso and add chili paste to taste. In bbq and grilling, korean, main course, poultry. Bookmark the permalink. Great photos, Romain! This looks absolutely mouthwatering! I love miso on grilled chicken– the little bit of sweetness gives a nice caramelization. Plus gochujang tastes good on anything. This is my kind of chicken dish! I’m not really a fan of chicken thighs though. Do you think I could use chicken breasts on the bone to make this? Thanks for sharing this amazing dish! I think it would work great on any chicken. Thighs, drumsticks, breasts – even wings would be good. While this recipe sounds amazing, the photos are phenomenal! I love the slight char going on, might be my favorite part of grilled chicken. I definitely need to get more creative with my chicken game, this spicy miso chicken looks like the perfect recipe to pull me out of my comfort zone, thank you! Thank you so much Erica. If you can get your hands on the ingredients this recipe comes together in no time flat. The chicken is great on a Buddha bowl too if that’s your thing. Miso and gochujang area a great combo for sure. My BBQ just got buried by snow again. Never seems to end this year. You convinced me to invest in a charcoal grill this spring, AND coincidentally I bought some Miso last week, for the first time. Sounds like the start of a brilliant friendship. Attempting to host an asian theme party. for the chicken can I prepare a freeze meal before time, by saving in a vaccum bag and grill it on the day of the party? Thank-u appreciate your input. I’ve made this 3x already. Fantastic recipe that my whole family loves! Great to hear. Isn’t miso great stuff? This recipe is AMAZING! I made it for the first time about a month ago. I’ve made it 4 more times since! We can’t stop eating it. The chicken is so tender and so full of flavor. Thank you SO much for this recipe! I’d give it 100 stars if I could! Thanks for saying so. You are very welcome. It’s one of my favourites too.